We had a fantastic trip, largely due to the excellent planning from our travel agent Claudia. Thank you for all of your efforts, Claudia!! 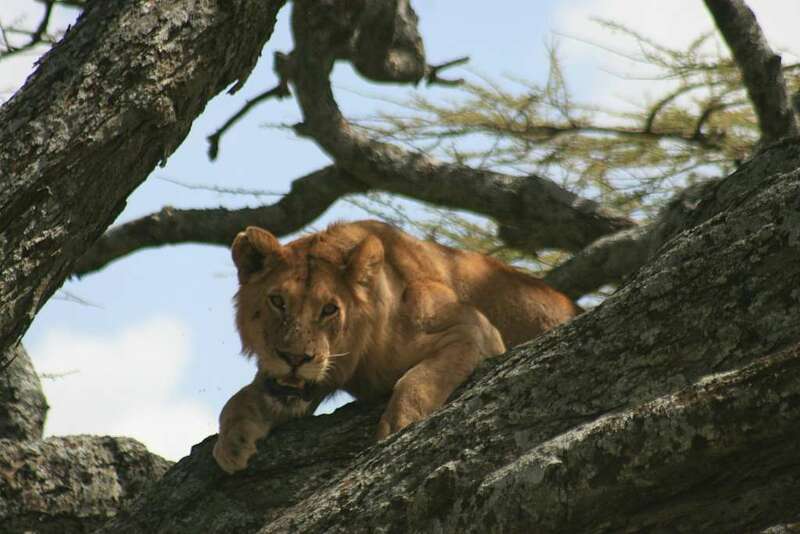 A&K in Tanzania were fantastic – our driver & guide, Donald, was outstanding!! We took an early morning train from Ulm to Frankfurt, then flew Frankfurt-Amsterdam-Kiliminjaro. It was a long day, but then it was nice to be immediately greeted by an A&K rep inside the terminal. We got to the Riversides Lodge in Arusha in the early morning hours, to bed at around 2am. Donald picked us up at 10am, and we had already seen various monkeys around the lodge. That was big for us – our first wildlife! We drove through Arusha to the Maramboi Lodge on Lake Manyara – the drive was good. More on the accommodations later. That afternoon, we did a game drive in Tarangire and it was great – lots of elephants, warthogs etc etc; and the giraffes at the end were a huge highlight for our daughter Kayla!! The next morning was all in Tarangire and it was again, excellent. Seeing the pride of lions was exciting. We spent a nice afternoon swimming and relaxing at the lodge. The next day we left Maramboi and did a game drive at Lake Manyara. It was a very nice park, lots of baboons and some other wildlife. Overall, it was a bit slower than the other parks, but we were still pleased to have experienced it as the landscape was so different. We had lunch at the cliff-top Serena Lodge and it was delightful! We headed towards Ngorongoro after lucy and had a late afternoon swim at the lodge. We spent the next day in the Ngorongoro crater and this was magnificent! We saw a huge variety of animals and it was quite simply great. After leaving the crater, we visited a Masaai village. While interesting, this was the low point of our vacation. We did buy a couple of bracelets against the recommendation of Donald, but we decided to contribute something. We then visited their local school, at their request, and they made us feel very uncomfortable if we didn't leave something. I gave them a small cash donation, but the whole experience left us with the feeling that they simply wanted cash for our visit. It would have been nice for clearer information on what we have already paid (or not) for this visit. We then returned to the lodge for the late afternoon & evening. Our next day was a drive to the Serengeti and a stop at Oldupai Gorge. The Gorge was very worthwhile for us. It doesn't take a lot of time, but is a refreshing switch from what we had been doing for the past few days. Our 12yo daughter was intrigued and the presentation from their staff person was excellent. We headed into the Serengeti through a mass of Wildebeest & Zebra that were part of the great migration. It was most impressive. It was early evening when we arrived at the Mbuzi Mawe Lodge. Our next day in Serengeti was excellent. The day afterwards, we did a short game drive and then headed to the airstrip for our flight to Arusha en route to Zanzibar. Our driver took complete care of us until our departure, which was nice. We were very impressed that an A&K rep from Arusha came to the Arusha airport to ensure that everything was OK. This was beyond our expectations, but certainly appreciated! The fl;ight to Zanzibar went well. We were met by a representative from the Pongwe Beach Resort at the airport and he transferred us immediately to the hotel. We spent the next two days at the resort, which was excellent. On our last day, we had a hotel driver drive us to Stonetown where we walked around on our own and then had lunch. The driver met us at the restaurant and took us to the airport. Our flights home, through Nairobi and Amsterdam, were excellent. Overall, we were very pleased with all of our accommodations. On the mainland, we felt that the accommodations kept getting better with each success place. We were only at the Riversides Lodge for about 8 hours, so it is tough to give a detailed assessment. For a late night arrival and morning departure, it was very comfortable. The Maramboi Tented Camp was very nice. They are clearly doing some upgrades, which is good. The location is excellent, the staff were extremely friendly and welcoming, and we were pleased with our room. We appreciated the wireless internet, although it worked only sporadically. The food was good, but not at the same level as the subsequent places. The Ngorongoro Farm Lodge was excellent. It is a mature property and we appreciated the pool and pre-dinner entertainment. The absence of wireless was the only downside (or is that a positive?). We were very pleased with the food. The Mbuzi Mawe Lodge was a step beyond even the Farm Lodge. The facilities were excellent and the food extremely good. The Pongwe Beach Resort on Zanzibar was a great place to stay for a beach vacation. They have a great location and there is plenty of room for the guests, even if all 20 rooms are full. The best part of the Pongwe was the food – truly exceptional! The worst part – the rooms, especially the bathrooms need some upgrading. Again, this was a great vacation for us – thank you for everything! !